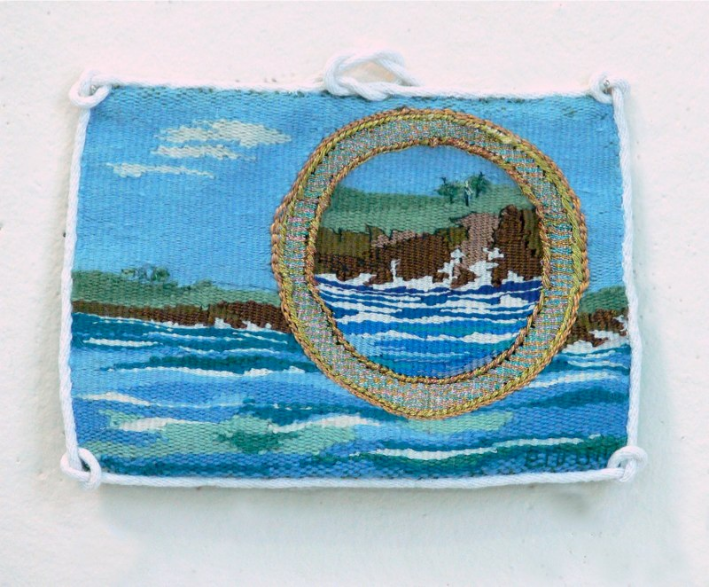 An important component of the Work Over Time series is to allow the artist a chance to talk about tapestry weaving and his or her career as an artist. ATA asked Barbara a series of questions about her work. Her answers add to an understanding and appreciation of her creative process and the development of her craft over the course of her career. 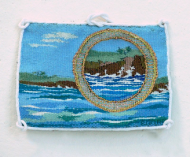 How did you settle on tapestry as your medium of expression? Tapestry was not my first love but it has been an enduring one. When I was getting a degree in art education in the early seventies, I was a printmaker and loved the graphic quality of a serigraph. But I became allergic to the varsol-based inks and developed chemical pneumonia – water-based inks had not yet been created. Since I was teaching what is now known as surface design at several schools and art centres, switching to painting on fabric became a way to continue to express my ideas. Many years before, I had taken an evening course in someone’s basement, learning the rudiments of tapestry on a frame loom. At university, the design course was really a course in fibre arts. I was inspired by a traveling show of Polish tapestry at the local art gallery and realized that one could weave anything one could paint. 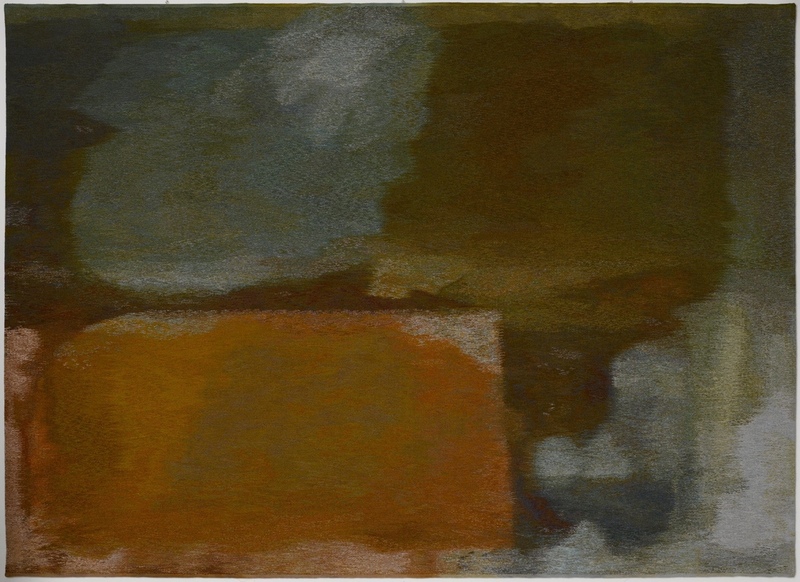 In 1975, as a major project, I wove a large tapestry using my own handspun naturally dyed yarn – a project beyond my competence but one that taught me a lot since I had no books or teacher knowledgeable in tapestry. I continued to weave a tapestry a year, but fabric printing and painting and quilting were my love and what I sold at craft markets. Then I got pregnant and did not want to work with fabric dyes any longer. When my son was born, I realized I needed an art medium that I could leave at a moment’s notice – you can’t stop in the middle when you are painting with thickened dyes, even if the baby is crying. 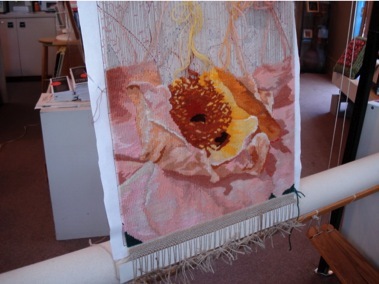 So, in 1980 I became a full-time tapestry artist and I haven’t looked back since. How have your subject matter and artistic intent changed over time? 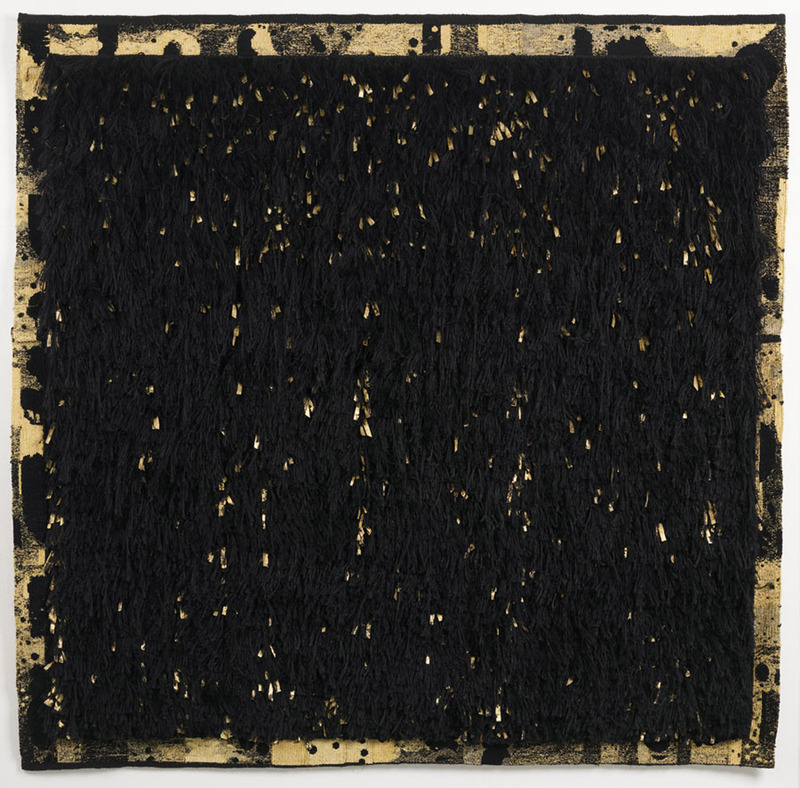 I began by weaving landscapes and stone walls and slowly began to make more personal statements. I have always made art about what disturbs me and touches me, as a way of dealing with the world and trying to understand it. As I have grown older, my statements have become more political and more blatant. I want to make a difference; I want people to think and feel and react to what they see. When I need a touch of simple beauty, I weave small format flowers and galaxies and landscapes. 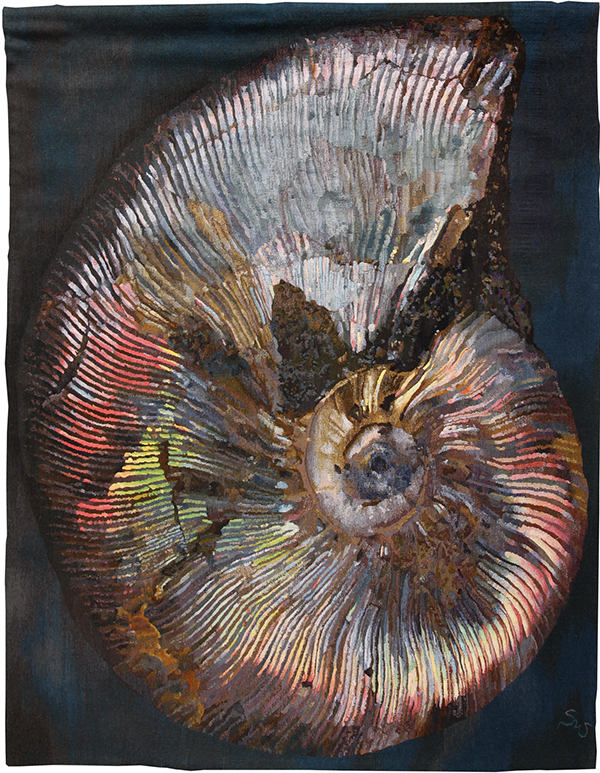 When I began to seriously devote myself to tapestry, I approached the imagery from my printmaking background and my work was quite graphic in a design sense. I set myself a series of colour studies and transparency studies using a diamond superimposed on a landscape. I also began a series of stonewall tapestries in 1980, weaving one every year or so (the latest, number 20, was completed this year). These semi-abstract tapestries are a chance to explore colour and texture using handspun and all sorts of commercial yarns and to just having fun with weaving. I was drawn to stone walls that showed the hand of the builder in chisel marks and that were constructed without mortar. It was the traces of the spirit of the people who built the walls that interested me. But people who saw the work responded that walls were divisive and shut people out. I decided to be more obvious and to show the ghosts of the people who had created and lived with the stones. Thus the ghost image series began. After about six years of weaving these transparent figures, I felt I had mastered the technique and exhausted what I had to say. Along the way there was a series of tapestries for the spirits of birds my cat killed but did not eat. Over time, the dead bird image became a personal icon representing senseless killing of all kinds, man’s inhumanity to man. I have woven commissions which are usually more bland but always I have felt they represent a greater message. 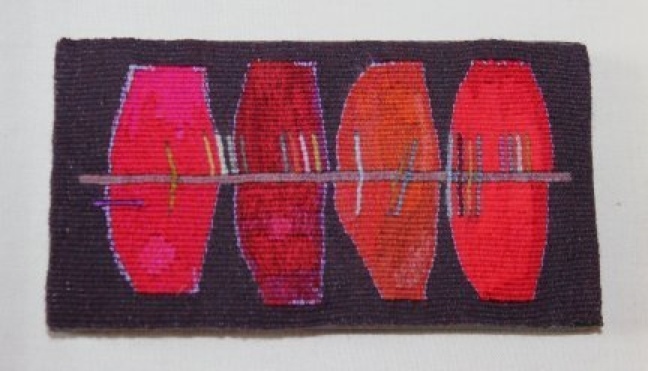 I have woven work embodying and reflecting my Jewish heritage. I started a series about displaced children but only wove two in this series. 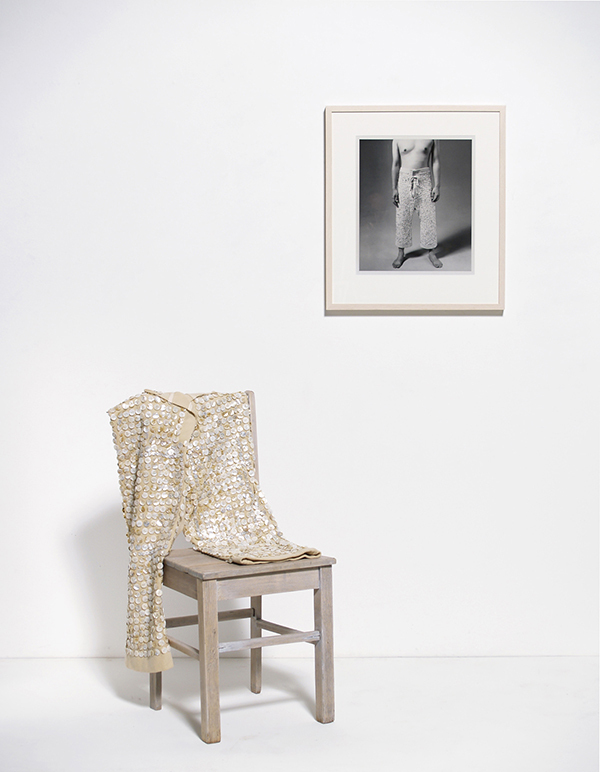 The Cover-up Series evolved from a tapestry I wove for the millennium and from an interest in protective gear – the wearer thinks he is invulnerable from the mess he has created, whether it be pollution, war, disease, racism, any and all the ills of our current world. I was fascinated with how we try to “read” people by their clothing when we cannot see their faces, by how we pass judgment without actual communication. And the Revelation Series is simply a need to comment on the mess humanity is creating. So many complex ideas to express and I do not have the words. But I can make the images and let people react. How has your use of materials changed over time? Basically, I have always woven with linen warp. In the beginning, in the seventies, I of course used all handspun, nature-dyed wool. Now, the yarn is in service of the image. I still dye over 75% of my yarns, but I certainly do not spin them all and I do not even use all wool. I use whatever yarn will best capture the essence of what I am weaving. And I have used bones recently and will use computer parts in the future. The idea comes first. What saddens me is that I have been weaving images of war and destruction, dead birds and misunderstandings and worse for over 25 years, and they are as relevant as when they were woven – nothing has really changed. But we need to keep trying to change the world for the better, each in our own way. So I will try to keep weaving tapestries that make people stop and think and that reach them on an emotional level. Hopefully my messages will become internalized and might even lead to action. My new work is still in the formative state and I do not have the words to express all its facets. The use of bones and my interest in memory and how it affects our actions has led me to research ossuaries and reliquaries, objects that contain the bones of saints. My concern for our deteriorating environment and the inability to recycle my computer and printer led me to take them apart and to become fascinated with their innards, their bones. My mother died this year, my father ten years ago, and in cleaning out their home I have kept old pieces of paper and scraps of fabric and things that evoke their lives. I want to use these materials, but am not sure how yet. 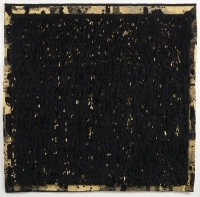 I have woven five small tapestries in which a golden arm and hand is superimposed on a background of an ethnic textile changing into a circuit board. The patterns are remarkably similar. Next, I want to weave larger tapestries where there is a small door in the arm that will open to reveal a computer part. And maybe to make three dimensional arms covered with collage. And to weave some of these as tapestries. Beyond that, the ideas are too amorphous to express as yet.